We’re all looking for low-water, easy-care plants these days. Beyond the usual suspects of cacti and succulents, there are plenty of plants that take less water than you might expect. Here are some of our tried-and-true favorites from the Sunset Test Garden. 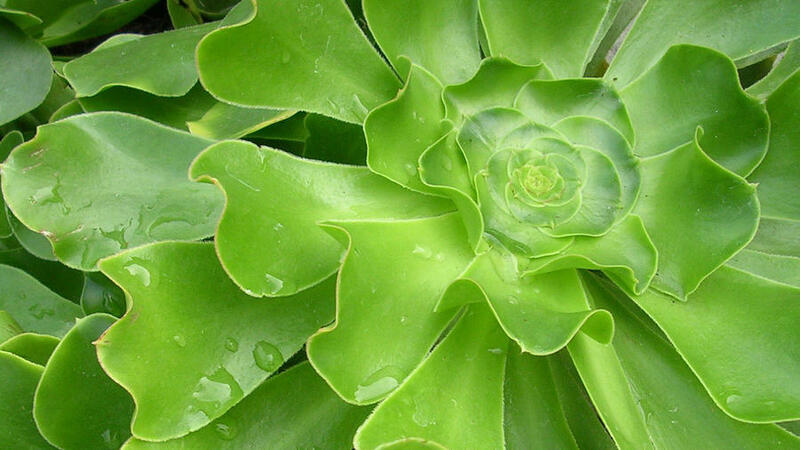 The succulent rosettes of aeonium (pictured above) take little water to thrive. With their bold form and upright growth habit, they’re one of our go-to accent plants in Test Garden beds and containers. The chartreuse foliage of South African native ‘Breath of Heaven’ (Coleonema pulchellum ‘Sunset Gold’) provides a bright pop of color along the pathways of the Sunset campus. Although ‘Breath of Heaven’ does take regular water when first planted, once established we’ve found it to be fairly bullet-proof. If you’re going for a cottage garden look, feverfew should be high on your list. In the Sunset Test Garden, we use golden feverfew to cap the ends of our planting beds—sometimes it’s watered by drip irrigation and often it’s off irrigation entirely. All spring and summer, it looks lush and full of the sweetest daisy-like flowers. The lush foliage and dramatic lime-green globes of flowers make Gopher Spurge (Euphorbia characias wulfenii) another low-water favorite for mixed borders. Technically what look like bloom spikes are actually showy cyathium cups surrounding tiny flowers. The same is true of poinsettia, a related Euphorbia. These drought-tolerant Mediterranean natives have stunning three-to-four foot tall flower spikes with canary yellow blooms. Jerusalem Sage (Phlomis fruticosa) works well planted with other sun-lovers such as artemesia, penstemon, native California sage, and rosemary. With their fragrant blooms and tidy habit, lavenders make lovely informal hedges and are stunning planted in drifts. All varieties need full sun and take moderate to low water once established. ‘Violet Intrigue’ is of our favorites from the Sunset Test Garden. These stately Mediterranean trees thrive in arid climates with little to moderate water. Around the Sunset grounds, we have them planted in tiled courtyards and along walkways. Pro tip: Look for non-fruiting varieties such as ‘Swan Hill’. Not all roses are low-water, but many can survive a drought if watered deeply a couple of times a month during summer. Carpet roses and many of the vigorous shrub roses are more drought-tolerant. For low-water climbers, look for ‘Sally Holmes’ (pictured), ‘Lady Banskia’, and Sunset Test Garden favorite ‘Fourth of July’. Planted to billow between boulders along paths, thyme makes an aromatic addition to any garden. At Sunset, we grow culinary thyme for use in our Test Kitchen as well as ornamental variegated thyme and brightly-colored lemon thyme. All varieties need full sun and very little water once established. This low-water favorite for perennial gardens blooms from summer well into fall. Look for pale yellow ‘Hoffnung’, golden ‘Moonshine’ (pictured), creamy ‘Calistoga’, deep pink ‘Cerise Queen’ and bright red ‘Fire King’.